The Wall Street Journal Europe, March 19, 2001.
Who Taught Crony Capitalism to Russia? How Harvard and the 'U.S. government's aid agency became part of the Russian problem. After the breakup of the Soviet Union, the United States had an opportunity to build a new political and economic relationship with Russia. Instead, the most promising rapprochement of the past century became a debacle. This is a cautionary tale of what went wrong and what policy makers should learn from one of America's greatest foreign policy blunders. The story takes off early in the Clinton administration, when the U.S. Agency for International Development (USAID) - responsible for overseeing U.S. foreign aid-decided to funnel much of its economic assistance to Russia through Harvard University's Harvard Institute for International Development. That the United States essentially put one of its most important foreign-policy initiatives in the hands of a private entity is largely unprecedented. U.S. federal regulations would seem to prohibit the delegation of such an "inherently governmental function" as the conduct of foreign relations. Thanks to Harvard's associates in the Clinton administration, the institute's requests for funding largely bypassed the normal public bidding process for foreign-aid awards. "Foreign policy considerations" was the justification. Soon, the Institute was dispensing U.S. aid to and wielding influence in Russia. It is alleged that key Harvard players sometimes obstructed reform initiatives that originated outside their own group. As Mr. Zanardi observed: The Harvard people were motivated "to keep power within their own structure." When USAID awarded Stanford University a contract to work with Russia's Federal Commission on Securities, the Russian commission's top man turned down Stanford's help. Harvard project director Andre Shleifer explained that the man "had a group of people he was working with," i.e. Harvard. USAID later awarded funds to Harvard for the same project that Stanford was to have carried out. In GAO bureaucracies, USAID's management and oversight of Harvard was "lax." Mr. Rodokanakis puts it more plainly: USAID's oversight over Harvard was "minimal to nonexistent. Harvard was doing whatever it wanted." The Harvard group worked directly with a small group of Russian insiders, the so-called "Chubais Clan," named after Anatoly Chubais, an aide to Russian President Boris Yeltsin through much of the 1990s. U.S. Treasury Secretary Lawrence H. Summers, a key architect of U.S. economic policy toward Russia since 1993, dubbed the Chubais "reformers" a "dream team." Mr. Summers- who has just been named president of Harvard University - had deep-rooted ties to the principals of Harvard's Russia project. Mr. Shleifer was a protégé of Mr. Summers. The two have numerous joint publications and received at least one foundation grant together. Mr. Summers' blurb endorsing "Privatizing Russia," a book partly written by Mr. Shleifer, declares: "[t]he authors did remarkable things in Russia." On alleged grounds of “foreign policy” considerations the Harvard Institute was granted some exemptions to competitive bidding and given authority over other contractors, some of whom were their competitors. The Harvard principals were therefore the chief recipients and the managers and implementers of that aid. The virtual carte blanche given the Harvard group enabled them to wear all manner of hats, from government to business and university. Their conflicting roles went beyond investments in Russian securities, equities, oil and aluminum companies, property and mutual funds named in the law suit. Although ostensibly a representative of American aid, Mr. Hay was able to approve some privatization decisions of the Russian state on authority given him by the Russian members of the Harvard-Russia group, some of whom also served as officials in the Russian government. Remarkable turns out to be an understatement. The administration bolstered the Chubais Clan's standing as Russia's chief broker with Western governments and international financial institutions; the Clan helped manage hundreds of millions of dollars in Western aid and loans. This virtual blank check hindered the development of a legal and regulatory backbone for Russia's nascent market economy. The Chubais Clan, with help from Harvard, presided over a network of USAID-funded and created organizations, set up to conduct economic reforms. These funds may have contributed to the Clan's political and financial base, according to USAID-paid consultants and information obtained from the Chamber of Accounts, Russia's equivalent of the GAO. While formally private, these organizations often acted like government agencies, thereby helping to stunt the growth of a truly democratic state. The donors' flagship organization was the Moscow-based Russian Privatization Center. Mr. Chubais served as chairman of the board; Mr. Shleifer served on the board of directors. Center documents state that Harvard University was both a "founder" and a "Full Member." Although nongovernmental, the center helped carry out government macroeconomic policy and negotiated loans with international financial institutions on behalf of the Russian government. The center received some $45 million from USAID and hundreds of millions of dollars more in grants from other Western countries, the World Bank and the European Bank for Reconstruction and Development. Another Harvard-Chubais run organization, the Institute for a Law-Based Economy, was funded by USAID and the World Bank. The Harvard Institute was supposed to help pass laws through the Russian legislature. Instead, the Harvard-Chubais team concentrated on writing presidential decrees and shunned other market reformers. The ILBE's Russian directors were caught removing $500,000 worth of U.S. office equipment from the organization's Moscow office in August 1997. The equipment was later returned. USAID's and Harvard's sponsorship of these dubious organizations encouraged an opaque and unaccountable system-precisely when donors and international financial institutions should have been demanding transparency, property rights, the sanctity of contracts and other safeguards. U.S.-sponsored "reforms" of the 1990s left many Russians worse off. Many Russians blame the Western aid and advice they have received. E. Wayne Merry, a former senior political officer with the U.S. Embassy, explains: "The effort to build the new socialist man, scientific socialism, had left people feeling completely alienated from their authorities. One of the most-popular slogans was 'No More Experiments.' ... And unfortunately, what they got in the 1990s was another series of experiments, where many of the scientists conducting the experiments were not even Russians, but were people sitting in the offices in Washington." By promoting Harvard and the media-savvy Chubais reformers and excluding other potential Russian allies, the United States may have inadvertently encouraged anti-Western, anti reform elements, who can point with glee to the absence of real benefits to Russia. In one poll, only 3.7% of respondents felt that the West was "trying to help." This past fall, the U.S. government filed a $120 million suit against Harvard University, the Harvard project's two principals-Mr. Shleifer and Harvard's on-site director, Jonathan Hay-and their wives. The suit alleges that the two principals "were using their positions, inside information and influence, as well as USAID-funded resources, to advance their own personal business interests and investments and those of their wives and friends." All the defendants have denied the allegations in the U.S. government's case. It can be argued that USAID was negligent in oversight; it wasn't until 1997 -after so much damage had been done- that the agency's inspector general began to investigate. But bringing to account a few officials and a few of Harvard's best and brightest will treat the symptoms, not the disease. The underlying problem is the U.S. government's decision to permit foreign policy to be conducted through an unaccountable nongovernmental entity that, in turn, provided legitimacy for a group of self-interested insiders from both sides. Under the guise of economic reform and in the name of democracy, the Clinton administration exported a form of politics that resembled the informal and powerful patronage networks that once ran the Soviet Union. It is self-defeating when the means of reform instead mirror and reinforce the very clannish and opaque political culture that the U.S. purports to reform. Such behavior breeds cynicism on the part of the recipients of American assistance about democracy, law, and the U.S. The only way to cure this creeping cynicism is to hold institutions accountable, not just people. The U.S. Congress needs to ask hard questions of USAID. Given the debacle in Russia, what else don't we know? "The shadow army," The Boston Globe, September 30, 2007. 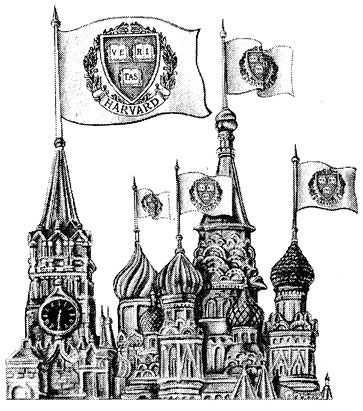 "Harvard's role in US aid to Russia," The Boston Globe, March 25, 2006. Omitted Material from the 2006 Boston Globe article.